Lasseter talks Cagliostro, courtesy of Scott Green. Gatsu, First Warning: You've been doing this a lot lately, and it's time something was said. Sitewhoring is allowed ONLY in the sitewhore / random links thread. If you want to post a link, you have to SAY SOMETHING ABOUT IT and not just post the URL and call it a day. The Japanese-Canadian rock group Monkey Majik has created an animated music video in which the band members meet the Lupin, Jigen, Goemon, and Fujiko characters from Monkey Punch's Lupin III manga and anime franchise. The Oricon website is already streaming the full 187-second video on Wednesday. And IMO it's a really nicely done video, too. Character designs look a little like a cross between Alcatraz Connection (in fact, the song covered is the Alcatraz Connection English-lyrics version of the themesong), Mamo, and Monkey Punch's manga art, and the general feel of the animation reminds me just a tad of Gorillaz' video for 19-2000. Aw, yeah. The animation is gorgeous, seriously. The character designs allow for strange, fluid expressions and are a throwback to the older stuff you mentioned, and they look great for it. If the specials/OVAs of late were this good, Lupin's popularity would skyrocket, I guarantee it. The Monkey Punch-ness of the character designs was probably intentional, as they were used previously in (the sadly fansub-less)Mankatsu and in "Samba Temperado" on Play the Lupin; both of which were based on Monkey Punch manga. And I agree, that is an awesome video, by the way. Very funny. Got a direct clip of Lasseter hyping Cagliostro. Fujiko fans come up with a band in her honor, courtesy of AICN Anime. Found an old promo of Lupin from his Adult Swim days, this one showcasing the chicks from the "Lupin in Paradise" episode (possible spoilers for those of you who haven't seen that episode, as well as semi-NSFW due to their "uniforms"). Enjoy! that was genius. 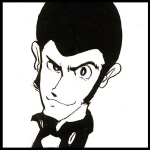 I can't believe I missed out on Lupin when it was airing on adult swim. You need Quicktime 7 to view 'em, but here's a collection of Adult Swim's Lupin promos and openings. They have 'em for their other shows, past and present, too. My favorite is the "Intro Promo". Having never seen that opening before at the time it aired, I thought it was one of the coolest things ever. Merged your thread, Linda. No biggy. Angelina: As long as there're pics, it's all good. The gift shop is the dream of every Lupin fangirl/fanboy, do you think they sell Jigen fedoras?